Viaggio in Italia is an exciting game that takes the players on a trip around Italy through questions about history, geography, culture, grammar, vocabulary and idioms. The game board is set around an outline of the country of Italy and takes the form of a photographic journey from city to city, showing geographical features, monuments, major holidays and traditions. The players throw a coloured dice and then draw a question from a pile of cards of the corresponding colour. Each colour represents a topic (e.g. green = grammar). In answering the question correctly, the player throws another dice to establish how many spaces they move forward on the game board. 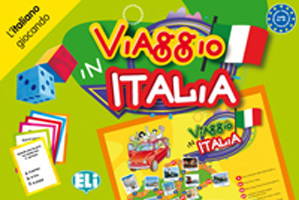 Viaggio in Italia is a great game to teach children all about Italy, while improving their Italian language skills. This game is aimed at children learning Italian as a second language and is suitable for intermediates who are able to respond to simple questions in Italian. Please note that the supplied instructions are in Italian - we are able to supply an English translation on request (free of charge - please let us know at the time of placing your order). The game "board" and dice are supplied in paper format - the board is a poster-style mat that folds out and the dice are flat-packed to self-assemble.